If you need flexibility in your ID card solution, take a look at the IDP Wise CXD80S Single-Sided ID Card Printer. Producing glossy photo quality, edge-to-edge printing, the IDP Wise CXD80S Single-Sided ID Card Printer is ideal for simpler applications like single-sided membership cards, gift cards, or on-demand ID cards and works just as well for secure corporate or government ID cards. The IDP Wise CXD80S Single-Sided ID Card Printer offers the versatility you need to produce ID cards in a dramatically smaller body design. 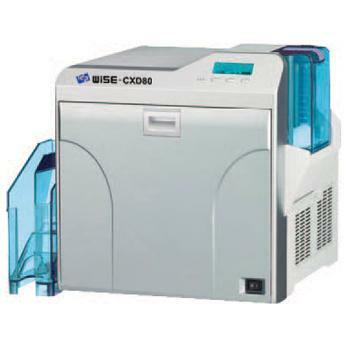 The IDP Wise CXD80S offers a small, lightweight, and compact body that can be carried to other locations to meet your on-demand printing needs. And the stress-free installation lets you easily set up the IDP Wise CXD80S Single-Sided ID Card Printer in the office, Kiosk, or remote facility. If you select the optional encoding units, the RFID encoder can be stored inside the printer during transportation. Security is a top priority, and the IDP Wise CXD80S Single-Sided ID Card Printer offers UV printing and security erase functionality for the K panel on your printer ribbon. The IDP Wise CXD80S also comes with security locks on the hopper and front door and a Kensington lock for the ultimate in securely producing ID cards. Print in color or monochromatic up to 29 seconds per card, and detach and refill the hopper at any time. The intuitive and flexible LCD panel offers simple functionality, and you can even remove the roller and clean it with water. The IDP Wise CXD80S Single-Sided ID Card Printer is designed for ultimate ease of use in an environmentally-friendly compact design. The IDP Wise CXD80S Single Sided ID Card Printer with Lamination features a 3-year warranty on printer and lifetime warranty on printhead.